"he is no more than an ordinary man like us." They have no reservations against praising or elevating themselves and their own people, with praises which they would be reluctant to apply to the Blessed Prophet (صلى الله عليه وسلم). Rather, they seek to denigrate his status to their own, and cast aspersions of misguidance and heretical innovation on anyone who declares that he (صلى الله عليه وسلم) has unique qualities separating him from the rest of creation, or that he is a light from Allah (Most High). This is due only to their arrogance, which has blinded them, for they see no one higher than them but Allah Himself, and so if someone (like the Prophet (صلى الله عليه وسلم) or his righteous inheritors) is praised above them, they imagine that he is being given the same status as Allah Himself! It would do them well to become humble and learn what their religion says about this unique blessed being, and not fall under the warning and curse of Allah which He saves for those who belittle His most Beloved (صلى الله عليه وسلم). So in this chapter, we mention some of what has come concerning his special distinctions, especially his being the first (created) light from Allah. 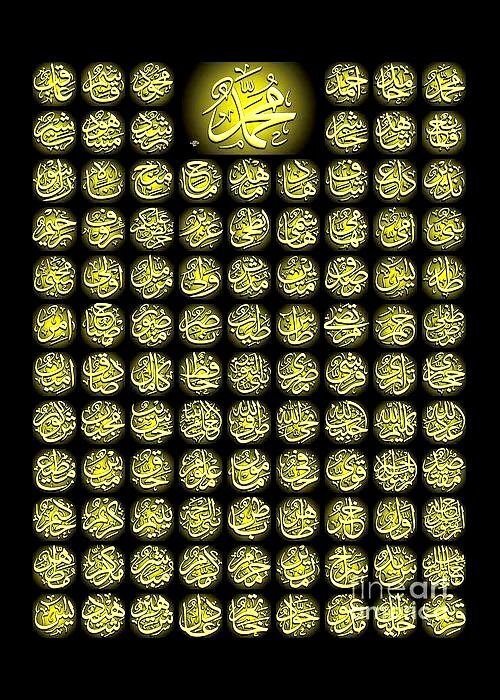 1) Allah (Most High) Himself has called the Prophet Muhammad (صلى الله عليه وسلم) a “light from Allah” and “a light-giving lamp”. He said: “There has come to you from Allah a Light and a Manifest Book” (Q5:15). The vast majority of the Mufassirin (excluding the Mu’tazila like Zamakhshari) interpreted the “light” in this verse to refer to Prophet Muhammad (صلى الله عليه وسلم), in that in his original reality he is a light from Allah. 2) Allah also said: “O Prophet! We have truly sent you as a witness, a bearer of good news, and a warner, and one who invites to Allah by His Permission, and a light-giving lamp (sirajan munira)” (Q33:45-46). “Muhammad (صلى الله عليه وسلم) is a tremendous light and the source of all lights…sirajan munira means a luminous sun, as in Q25:61. 3) As for the verse (Q18:110): “Say, I am a human like you who is Divinely inspired…”, then this is no contradiction to saying that the Prophet (صلى الله عليه وسلم) is created from the Light of Allah. The ruby is also a stone, but it has special distinctions and qualities that set it apart from other stones. Nor do we mean by “light” the physical light that we see when we turn on the switch in our rooms (even though his light did have a material aspect and on occasion manifested physically). Rather, there are other lights besides the purely material, which can be seen in such sayings of his (صلى الله عليه وسلم) as: “You should keep to the dhikr of Allah, for it is a light for you,”1 and “Wudu’ is bright light” (Sahih Muslim, #246). Indeed, he is both the “light from Allah” and a “human being,” and the inability to grasp both aspects of his blessed being is the shortcoming of the individual. Furthermore, this verse only means that he is a human creature, in other words, created and not creator, and that is the only way in which he is like us other humans. Otherwise, which one of us can say that he has received direct revelation from Allah, or that he has went beyond the universe and spoken with, heard, and saw Allah Most High (all at the same time)? It is a grave error to think that this verse means he is like us in all aspects, for he himself (صلى الله عليه وسلم) also said, “I am not like you…,” as we will see below. This image of him and attitude towards him is the exact and fundamental reason why the previous nations went astray and were punished. - “… They (Fir’awn and his people) became arrogant, and they were indeed a haughty group. They said, ‘shall we believe in two humans like us, when their tribes are subservient to us?’ So they rejected them, and came to be among those who were utterly destroyed” (Q23:46-48). - “So they (the disbelievers) tasted the severity of their doing, and for them is a grievous punishment. That is because their Messengers came to them with the clear proofs, and they said, ‘shall (another) human guide us?’” (Q64:5-6). - “So the disbelievers among his people said, ‘we do not see you except as a human like us…’” (Q11:27). human is a fatal sickness and a stain of disbelief (kufr) upon the hearts, which must be removed to receive the light and guidance of Allah. Another manifestation of that sickness and skewed understanding of Tawhid can be seen in the response of Iblis to the Order of Allah to prostrate to Adam (AS). He claimed that he was defending Tawhid because he refused to bow down before anyone except Allah, and not give “undeserved reverence” to any other creature. It is this same misunderstanding which is seen in those who imagine that by bringing down the Holy Prophet (صلى الله عليه وسلم) to our level as simply another human, we are safeguarding the Divine Oneness, when in truth we should be recognizing the awesome status and sublime heights which Allah (Most High) honored His Messenger (صلى الله عليه وسلم) with, and giving him his due reverence (صلى الله عليه وسلم). Ubayy ibn Ka’b, when the Prophet (صلى الله عليه وسلم) struck his hand upon his chest to correct him, said: “I began to sweat profusely and it was as if I was looking at Allah Most High Himself” (Muslim #1356, Ahmad 5:127, 129). Note: This hadith is not found in the current edition of the Musannaf of Abdur-Razzaq, which is only a partial collection since a number of its hadiths are lost. However, we have an indication that it might have been originally in there because Imam Qastallani (one of the commentators on Sahih Bukhari) narrates it in his Mawahib Laduniyya (1:55-56) and attributes it to Abdur-Razzaq from Jabir, and similarly Hafiz az-Zurqani (one of the commentators on the Muwatta’ of Imam Malik) in his commentary on the Mawahib states the same. ‘Ajluni in Kashf al-Khafa’ (1:265) also narrates the hadith in its entirety from Imam Qastallani. The hadith scholars consider it forged because its chain cannot be found anywhere, and because its wording is flimsy and uncharacteristic of the Prophetic manner of expression. However, the scholars consider the meaning of this hadith (specifically, the first sentence) authentic and sound, and it is supported by Qur’an (5:15) and other Sahih hadiths. Hafiz ‘Ajluni states the same in his Kashf al-Khafa’, quoting from other scholars, and he also explained that the meaning of the phrase “from His Light” is not to be understood literally, but rather it is understood in the same way that the Qur’anic verse (Q32:9) about the creation of Adam from the Spirit (Ruh) of Allah is understood. One of the famous supplications which he (صلى الله عليه وسلم) used to recite before Fajr was, “and increase my light, and make me light” (Sahih Muslim 1:525), which Allah Most High no doubt answered. Imam Fakhruddin ar-Razi wrote (Tafsir of Q2:253) that the angels were commanded to prostrate to Adam only because of the light of Muhammad (صلى الله عليه وسلم) which shined upon Adam’s forehead. All of these narrations above address how the original light of Prophet Muhammad (صلى الله عليه وسلم) was passed down thru his ancestors – all of whom were upright chaste men and women – down to his father Abdullah. Also, Ibn Kathir and Ibn Abi Hatim record in their Tafsirs that in the Mi’raj, the Prophet (صلى الله عليه وسلم) went beyond the Sidrat al-Muntaha and heard the screeching of the Pens writing the Decree, then saw his Lord. He then goes on to list 58 concrete examples of the Prophet’s (صلى الله عليه وسلم) knowledge of the Unseen and the future, which are mentioned in the hadith collections of: Bukhari, Muslim, Abu Dawud, Nasa’i, Tirmidhi, Ibn Majah, Imam Ahmad, Imam Malik, Tabarani, Abu Ya’la, Ibn Hibban, al-Hakim, al-Bayhaqi, Ibn Khuzayma, and others. It would be too long to reproduce that chapter in full, so the interested reader should read the chapter themselves. Allah says about the Prophet (صلى الله عليه وسلم), “And he is not stingy of (his knowledge of) the Unseen” (Q81:24). Mujahid stated that this was his (صلى الله عليه وسلم) state at all times (see Ibn Hajar’s Fath al-Bari 1:515 and Matalib al-‘Aliya 4:140). The Prophet (صلى الله عليه وسلم) neither called this shirk nor asked Mu’adh to repeat the Shahada and renew his Islam. Nor did he (صلى الله عليه وسلم) call it shirk when Qays ibn Sa’d affirmed his desire to prostrate to him (Abu Dawud #1828, Hakim 2:187 Sahih), nor did he ask him to renew his Islam. And when Khuzayma ibn Thabit told the Prophet (صلى الله عليه وسلم) that he dreamt that he prostrated on his (صلى الله عليه وسلم) forehead, the Prophet (صلى الله عليه وسلم) lied down and told him, “realize your dream,” and he prostrated on his forehead (Imam Ahmad 5:215 Sahih). hadiths, for he forbade that – but rather to point out to those ignorant of his mighty status and blazing light how the Sahaba revered him to such a high level that they found no hesitation in wanting to prostrate to him out of respect. I wonder today whether Imam Malik, for these words of his, would be considered a heretical innovator outside of Islam by some of our self-appointed modern scholars. “Muhammad (صلى الله عليه وسلم) is the chief (sayyid) of all the children of Adam,33 the best of creation and the noblest of them in the sight of Allah. This is why some have said that “Allah created the universe due to him,” or that, “Were it not for him, He would not have created a Throne, or Kursi, or a heaven, earth, sun, or moon.” However, this is not a hadith on the authority of the Prophet…but it may be explained from a correct aspect…Since the best of the righteous of the children of Adam (AS) is Muhammad (صلى الله عليه وسلم), creating him was a desirable end of deep-seated purposeful wisdom, more than for anyone else, and hence the completion of creation and the fulfillment of perfection was attained with Muhammad (صلى الله عليه وسلم)…thus it cannot be denied to say that ‘due to him all of this was created,’ or that ‘were it not for him, all this would not have been created,’ so if statements like this are thus explained according to what the Book and the Sunna indicate, then it is acceptable”. 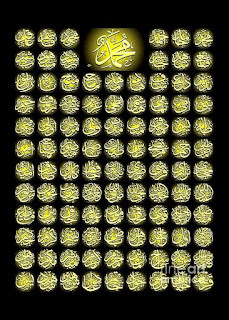 “Every tangible and intangible blessing (baraka) of Allah Most High in the heavens and the earth emanates from (meaning thru) the barakat of our Prophet Muhammad alayhi salat wa salam 34, who is without doubt the noblest creation of Allah absolutely and without exception… and his light (asws) is the origin of all lights and dense bodies, as he (asws) stated to Jabir. So he is the ontological intermediary (wasita) for all of creation, and had it not been for him there would be nothing created, as Allah said to Adam, ‘Were it not for him, I would not have created you’” (Sharh al-Saghir, 4:777-78). Related to this, there is consensus 36 among the scholars of the four madhhabs that the blessed place which contains his blessed fragrant body (صلى الله عليه وسلم) is superior to any other place on earth, and some (e.g. 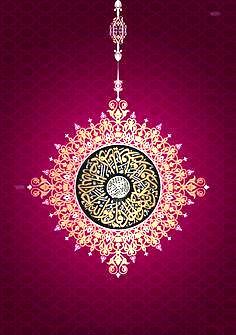 Ibn ‘Abidin al-Hanafi, Ibn ‘Aqil al-Hanbali, Salim an-Nafrawi al-Maliki) added even superior than the Divine ‘Arsh. 1 Recorded by Imam Ahmad (3:82, 266) and Abu Ya’la (2:284 #1000) in their Musnads on the authority of Abu Sa’id al-Khudri, and by Bayhaqi (Shu’ab al-Iman, #4942), Tabarani in his Mu’jam as-Saghir (2:66-67); also recorded by Imam Qushayri with his chain in his Risala (Beirut ed. 1998, p. 141). 2 Recorded by the reliable Imam and Hafiz Abdur-Razzaq San’ani (one of the Shaykhs of Bukhari and Muslim) in his Musannaf (one of the earliest collections of hadith). For a lengthy discussion on this hadith, see Imam ‘Ajluni’s Kashf al-Khafa’ (hadith #827). Hafiz Suyuti (Hawi lil-Fatawi 1:325) states that it has no reliable chain. 3 Recorded by Tirmidhi in his Shama’il (#14), Darimi (1:44 #58 Da’if), Diya’ (Mukhtara, 13:48), Bayhaqi in Dala’il an-Nubuwwa (1:215), and Tabarani in his Mu’jam al-Kabir (11:416 #12181) and Mu’jam al-Awsat (#767). 4 Recorded by Tirmidhi (#3551), Ibn Majah (#1621), Darimi (#88), Imam Ahmad (3:268), Hakim (3:59), Ibn Hibban (14:601), Diya’ (Mukhtara, 4:417-20), Abu Ya’la (6:110), Ibn Sa’d (2:274), Hafiz Khatib (13:15), and others, and is Sahih according to Tirmidhi, Hakim, Dhahabi, Ibn Hibban, and Ibn Kathir (Bidaya, 5:274). 5 Recorded by Imam Ahmad in his Musnad (4:184 #16525, 16537, 5:262 #21231), Hakim in his Mustadrak (2:418, 600, 616-617 Sahih), Darimi (1:8-9 #13), Imam Bayhaqi in his Dala’il an-Nubuwwa (1:80-84,110 and 2:8), Ibn Hibban (14:313 #6404), Tabarani (Mu’jam al-Kabir, 8:206, 18:252-53, 20:353), Ibn Abi ‘Asim in his Kitab as-Sunna (p. 179 #409), Bazzar (Zawa’id 1:217, 3:113), Bukhari in Tarikh al-Kabir (6:68), Tayalisi (Musnad, #1236),and Ibn ‘Asakir (1:166-71). Also, Ibn Kathir narrates it in his Tafsir (4:360), as does at-Tabari (28:87), and Ibn al-Jawzi in Kitab al-Wafa’ (p. 91 ch. 21); and Haythami in Majma’ az-Zawa’id (8:222-23 #13841-42) said that Tabarani and Ahmad narrated it with authentic chains. Imam Suyuti in his Jami’ as-Saghir (#4359-60) also mentions that the last part is recorded by Ibn Sa’d in his Tabaqat (1:102), and it is Sahih according to Ibn Kathir (Bidaya, 2:275), and many others. 6 Recorded by Tirmidhi in his Sunan (#3542), Hakim (2:609), Bayhaqi in Dala’il an-Nubuwwa (2:130), Ibn Sa’d in his Tabaqat (7:59), Imam Bukhari in his Tarikh (7:374), Khatib in his Tarikh (3:70, 5:82, 10:146), and others. Tirmidhi and Hakim said it was Sahih. Imam Ahmad (#16028, 19686, 22128) and Tabarani (M. Kabir, 12:92 #12571, 12:119 #12646; M. Awsat, 4:272 #4175) record the same from Ibn ‘Abbas. See also Sakhawi’s Maqasid al-Hasana (p. 327 #837). 7 Quoted in Suyuti’s Hawi lil Fatawi (2:100-101) and Imam Qastallani’s Mawahib Laduniyya (1:31-32). 8 Recorded by Imam Bukhari in his Tarikh al-Kabir (7:374 #1606), Imam Ahmad (4:66, 5:59, 379), Tabarani (Mu’jam al-Kabir, 20:353), Hakim (2:608-09 Sahih), Ibn Abi Shayba (8:438), Abu Nu’aym (Hilya, 7:122 and 9:53), Ibn Abi ‘Asim (K Sunna p. 179 #410-11, Ahad wa Mathani 5:347), Imam Bayhaqi in Dala’il an-Nubuwwa (1:85, 2:129), Ibn Sa’d (7:60), Bazzar (Zawa’id, 3:112), Ibn ‘Adiyy (4:1486), Ibn Qani’ (1:347), ar-Rafi’i in Akhbar Qazwin (2:243-44), and others. It is Sahih according to Haythami (Majma’ Zawa’id, 8:223), Suyuti (Khasa’is al- Kubra, p. 3-4), Diya’ al-Maqdisi (Mukhtara, 9:142-43), and others. 9 Recorded by Imam Bukhari in his Sahih (#445, 3367, 3521), Imam Ahmad (#11955, 12511, 13367), Hakim (3:288 Sahih), Ibn Hibban (5:376 #2030, 5:378 #2032), Tayalisi (#2147), Ibn Sa’d (Tabaqat, 3:606), ‘Abd ibn Humayd (#1242), Nasa’i in Fada’il as-Sahaba (#141), Ruyani in his Musnad (2:389 #1378), and Bayhaqi in his Dala’il (6:77-78). 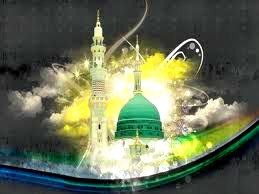 The two men referred to were Usayd ibn Hudayr and ‘Abbad ibn Bishr, and it refers to the light of the Prophet (PBUH). 10 Recorded by Ibn Abi Shayba (Musannaf, 8:131), Abu Nu’aym in his Dala’il an-Nubuwwa (p. 6), Ibn Sa’d in his Tabaqat (1:149), Daylami (Musnad Firdaws, 3:282 #4850 and 4:411 #7190), Ibn ‘Adiyy (Kamil, 3:919, 1209), Tabari (Tafsir, 15:10, 21:125-26), Baghawi (Tafsir, 3:508), Ibn Abi Hatim in his Tafsir (in connection to verse Q33:7 which says “We took from the prophets their covenant, and from you, and Nuh…”), with many chains of transmission. Imam Suyuti in his Tafsir (Durr al-Manthur 5:184) records it and states that it is also recorded by Ibn Mardawayh and Ibn ‘Asakir. Haythami (Majma’ 1:72) said: “Recorded by Bazzar with trustworthy narrators except one who is unknown (majhul).” However, Tabarani (M. Kabir, 22:333) and Ibn Abi ‘Asim recorded this hadith with similar wording, with a chain of trustworthy narrators accrding to Haythami (Majma’ 8:224). Hadith Sahih. Cf. Hafiz ‘Ajluni in his Kashf al-Khafa’ (#2006-07). 11 Qadi ‘Iyad narrates it in his Shifa’ (1:59), in the chapter on the nobility of the Prophet’s lineage, and Imam Suyuti states in Manahil as-Safa’ (p. 53 #128): “Ibn Abi Umar al-‘Adani recordes it in his Musnad” (see also Matalib ‘Aliya, 4:360). Also recorded by Daylami in his Firdaws (2:379 #3009). 12 Recorded from Ibn ‘Amr by Tirmidhi (#2566), Hakim (1:30-31), Bayhaqi (9:3-4), Ibn Hibban (14:43-45 #6169-70), al-Ajurri in his Shari’a (#337-38), Imam Ahmad (#6356, 6559), Tayalisi (Musnad, #2405), Bazzar (Zawa’id, 3:22 #2145), Hakim Tirmidhi in his Nawadir al-Usul (Asl #287), and Ibn Abi ‘Asim in K. Sunna (p. 107-08 #241-44). Hadith Sahih according to Hakim, Ibn Hibban, Haythami (Majma’, 7:193-94), and others. 13 Recorded in the Tafsirs of Qurtubi, Ibn Kathir, Suyuti, Mawardi, Baghawi, Ibn Jawzi, and many others, and also by Tabarani (Mu’jam al-Kabir 11:362) and Diya’ al-Maqdisi (Mukhtara, 12:101-02). Haythami in his Majma’ az-Zawa’id (7:86, 8:214) said that this was recorded by Bazzar in his Musnad (Zawa’id, 3:62, 110) with a chain of trustworthy narrators (thiqat). 14 Recorded by Imam Bayhaqi in Dala’il an-Nubuwwa (1:87), Imam Tabari in his Tarikh (2:243), Ibn al-Jawzi in his Kitab al-Wafa’ (Ch. 16), and others. Ibn Hisham recorded something similar in his Sira. 15 Also recorded by Imam Ahmad in his Musnad (#16026, #21093, #22126), Darimi in his Sunan (2:170 #2056), Tabarani in his Mu’jam Kabir (1:317 #938; 8:290 #8117; and also 20:109, 141), Abu Ya’la in his Musnad (4:475 #2608), Ibn Sa’d in his Tabaqat (7:438), Hafiz al-Khatib in his Tarikh Baghdad (8:151), Ibn Khuzayma (K. Tawhid, p. 130-31), Ibn Abi ‘Asim (K. Sunna, p. 188-192 #432-442 Sahih), Bazzar (Zawa’id, 3:13-15), Bayhaqi (Asma’ wa Sifat, p. 444), ‘Abd ibn Humayd (#681), Ahmad ibn Mani’ (see Ibn Hajar’s Matalib ‘Aliya, 4:148), Ruyani (Musnad #656, 1241), and others. Haythami in Majma’ Zawa’id (7:173, 176-179) and Suyuti in Jami’ as- Saghir (#4377) said it was Sahih. 16 See his Asrar al-Marfu’a (p. 126 #478). The hadith is recorded by Imam Ahmad (5:157, 171, 175), Ibn Khuzayma in Kitab at-Tawhid (p. 135), Hakim (1:65 Sahih), Tabarani (M. Kabir 10:363, 11:242-43, M. Awsat 6:50), Ibn Abi ‘Asim in Kitab as-Sunna (p. 192 #441 Sahih), Diya’ Maqdisi in his Mukhtara (12:233-34), and others. 17 Recorded by Muslim (Kitab al-Fitan, #5144) and many others. 18 Recorded by Tabarani in his Mu’jam al-Kabir (2:155 #1647), Imam Ahmad (#20399), Abu Ya’la (9:46 #5109), Ibn Hibban (1:267 #65), Ibn Sa’d (2:354), Bazzar (Musnad 9:341 #3897, Zawa’id 1:88), Tayalisi (#481), Ahmad ibn Mani’ (Matalib, 4:214), and others. It is Sahih according to Haythami (Majma’ Zawa’id, 8:263-64) and Busiri (Ithaf as-Sada, 1:133 #265). 19 See: Ibn Hajar’s Fath al-Bari (13:364) and Isaba fi Tamyiz as-Sahaba (2:619), Ibn Hisham’s Sira (5:203), Tabari in his Tarikh (2:184), and Abu Shaykh in Kitab al-‘Adhama, Bayhaqi (Dala’il, 5:232), and others. 20 Recorded by Bayhaqi in Dala’il an-Nubuwwa (6:74-75, Da’if), while Imam Suyuti said it was Hasan in his Jami’as-Saghir (#7027). Also recorded by Daylami (Firdaws, 1:100 #203), Ibn ‘Adiyy (4:1534), Ibn Bashkuwal in his Sila (1:73), and others from A’isha, and by Baqi ibn Makhlad in his Musnad according to Ibn Hajar. 21 Recorded by Bukhari (#700), Muslim (#644-45), Nasa’i (#804-06), Ibn Majah (#983), Abu Dawud (#571- 74), Imam Ahmad (3:161), Ibn Hibban (14:250-51 #6337-38), Bayhaqi (Sunan, 2:117, 3:100 and Dala’il, 6:73- 74), Abdur-Razzaq (#2427, #2462-63), Bazzar (Zawa’id, 1:245), and others. 22 Recorded by Ibn Mandah in his Fawa’id (p. 82 #56), Hafiz Asbahani in his Targhib (#1647), and Daylami (see Kanz al-‘Ummal #2242). Also mentioned by Suyuti in his Khasa’is (2:490) and others. 23 Recorded by Tirmidhi (Kitab az-Zuhd, #2234), Ibn Majah (#4180), Imam Ahmad (#20539), Hakim (4:579), Abu Nu’aym (Hilya 2:217), Tabarani (M. Kabir, 3:201), Abu Shaykh (p. 178 #509), Ibn ‘Asakir (52:381), and Daylami (1:100 #202). It is Sahih according to Hakim and Dhahabi. 24 Bukhari (#1079, 1874), Muslim (#1219), Ibn Khuzayma (#48-49, also: #1166), Nasa’i (#1679), Imam Malik (#243), Hakim (2:431), Ibn Hibban (6:186, 14:297), and many others. 25 Bukhari (#1827-28), Muslim (#1844, 1850), Imam Malik (#590-91), Abu Ya’la (#1133, 1407, 2874, 3282, 6088 Sahih), Imam Ahmad (#6125), Ibn Khuzayma (#2070-72), Ibn Hibban (#3581), and many others. 26 Darimi (#16), Abu Ya’la (10:34 #5662), Ibn Hibban (14:434 Sahih), Bazzar (Zawa’id, 3:133-34), Ruyani (#37- 38), and Tabarani (M. Awsat, #5068). It is Sahih according to Hafiz Busiri (Ithaf as-Sada, 9:111 #7243). Other hadiths about trees moving for him were recorded by Ibn Majah (#333), Ahmad (4:171), Tabarani (M. Awsat, 9:53, 81), and Abu Ya’la (Hasan according to Ibn Hajar in Matalib 4:196-97). 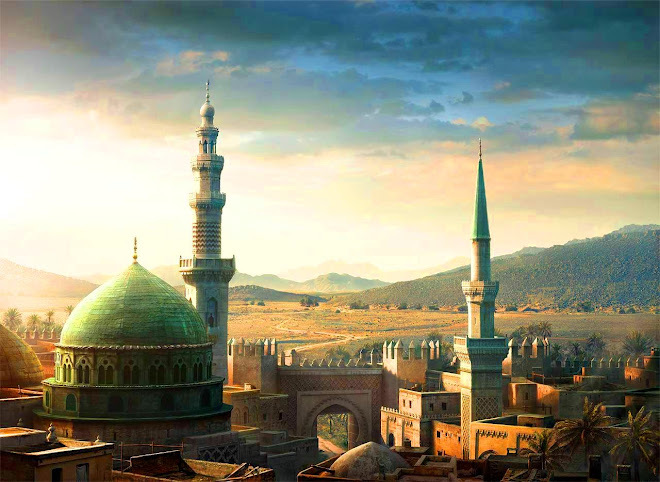 27 Recorded by Ibn Abi ‘Asim (Ahad wa Mathani, 4:73), Darimi (#17), Imam Ahmad (#12153), Tabarani (M. Kabir 11:356-57, M. Awsat 9:81-82), Bazzar (Zawa’id, 3:150-52 Hasan), Bayhaqi (Dala’il, 6:29), and Ishaq ibn Rahawayh (Matalib, 4:190-91). For more see: Ibn Majah’s Sunan (#1842), Musnad Ahmad (5:214-15), Diya’ (12:338-39), ‘Abd ibn Humayd (#216, 1051), and others. Ibn Kathir in his Bidaya (6:137-38) accepts Ahmad’s chain as authentic. Cf Haythami (Majma’ 9:7). As for the clause at the end of some of its narrations “worship your Lord and revere your brother Muslim,” it is not an authentic part of it. 28 Recorded by Ibn Majah (#1843), Ahmad (4:381), Diya’ (Mukhtara, 13:124-25), Bazzar (Zawa’id, 2:179-80), Tabarani (M. Kabir, 5:208, 8:31, 20:52), Hakim (4:172), Ibn Hibban (6:186), Ibn Abi Shayba (3:397), Bayhaqi (Sunan, 7:291-92), Tahawi (Mushkil Athar, 2:210), and Baghawi in his Tafsir (Q2:228, 4:34). It is Sahih according to Hakim, Dhahabi, Diya’, Busiri (Ithaf, #3833), and Haythami (Majma’ 4:309-10). 29 In his Mu’jam al-Shuyukh (1:73), in the entry about his Shaykh Ahmad al-Qazwini (#58). 30 Narrated by Qadi ‘Iyad in his Shifa’ (2:26-27) and Tartib al-Madarik (1:113-14) with an authentic chain, Imam Subki in his Shifa’ as-Siqam (Ch. 4, 7), Qastallani in his Mawahib Laduniyya, Ibn Bashkuwal (Qurbah p. 84), and others. The chain is as follows: a group of the teachers of Qadi ‘Iyad narrated to him from Abu’l Abbas Ahmad ibn Dalhath (one of the Shuyukh of Ibn ‘Abd al-Barr, who is “thiqa hafidh” – Siyar 18:567), from Abu’l Hasan ‘Ali ibn al-Fihri (one of the Shuyukh of Bayhaqi, d. 488H, “muhaqqiq” – Dhahabi’s ‘Ibar 1:227), from Abu Bakr Muhammad ibn al-Faraj al-Jaza’iri (“thiqa” according to Ibn Mundhir – Sam’ani in Ansab 2:55), from Abu’l Hasan ibn al-Muntab (the Qadi of Madina in his time, and one of the top Huffaz of the Malikis – Ibn Farhun in Dibaj and Sakhawi in Tuhfa Latifa), from Ya’qub ibn Ishaq (one of the Shuyukh of Tabarani; Daraqutni: “la ba’sa bih” – Khatib in Tarikh 14:291), from Khalid ibn Humayd al-Iskandarani (d. 169H, a faqih among the companions of Imam Malik – see Tartib al-Madarik 1:178 and Khafaji’s Nasim ar-Riyad 3:397; this is not Ibn Humayd ar-Razi as some have claimed), from Imam Malik (d. 179H). Not one of the Maliki scholars rejected it or stated it was false, and all of them accepted it and acted upon it; so no attention is payed to Ibn Taymiyya, who rejected it, supposedly knowing more about what Imam Malik said or didn’t say than the Maliki scholars themselves! What also supports this is that when the Prophet (PBUH) himself would visit the graves of Madina and greet them and make du’a, he would face the graves, as is specifically mentioned in the hadiths about that… meaning facing the grave when making du’a is a Sunna. And when Ibn Umar would come to Madina, he would first visit his (PBUH) grave and make du’a facing him, and do the same with Abu Bakr and ‘Umar (Hilya, 1:308-09). Nor can Ibn Taymiyya or his followers name a single Sahabi who said it was disliked or prohibited to face his grave (asws) when making du’a. In addition, it is the madhhab of Imam Malik that one makes du’a facing the Prophet’s grave (not the Ka’ba) when one visits and greets him (asws), as related from Malik by Ibn Wahb, Ashhab, and others, and recorded in the books of Maliki Fiqh (e.g. Ibn Mawaz, Ibn Juzayy’s Qawanin Fiqhiyya 1:95, Qarafi’s Dhakhira 3:375-76, Ibn Rushd’s Bayan wa Tahsil 18:108, 444-45, 601-03, etc). 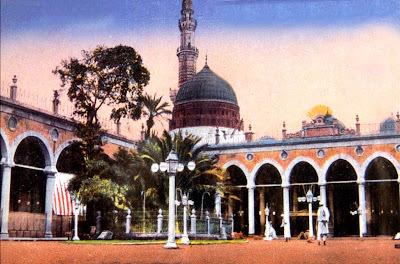 The most Imam Malik ever said – as stated in al-Mabsut by Qadi Isma’il (broken chain) – is that it is disliked specifically for residents of Madina to spend hours every day making du’a at his grave, but not for those visiting from outside Madina. There is no book of Maliki Fiqh which states that it is disliked to make du’a at his grave, or which weakens this story of Malik with Abu Ja’far. The other madhhabs also mention specifically facing him (PBUH) when making du’a at his grave: (Hanafi): Tabaqat al-Hanafiyya 1:282, Ibn Humam’s Sharh Fath al-Qadir 3:180-81; (Shafi’i): Nawawi’s Majmu’ 8:201-02; (Hanbali): Ibn Qudama’s Mughni 3:297-99. 31 Recorded by Hakim in his Mustadrak (2:615) who said it was Sahih while Dhahabi said it was Mawdu’, Imam Bayhaqi in his Dala’il an-Nubuwwa (5:489), Tabarani in his Mu’jam al-Awsat (6:313-14 #6502) and Mu’jam as- Saghir (2:82-83), Ibn ‘Asakir (Tarikh, 7:437), and al-Ajurri in his Shari’a (p. 432). Their chains all contain Abdur- Rahman ibn Zayd ibn Aslam, who’s narrations are Da’if because of his mistakes and weak memory (see Ibn Hajar’s Tahdhib 6:161-62), as Bayhaqi said. al-Ajurri also related it with another Da’if chain (p. 430) without Abdur-Rahman. The reality is that this hadith is Hasan, not Mawdu’ as Dhahabi stated, for the following reasons. 1) Abdur-Rahman is not a liar or forger, but only Da’if, and the text is not disclaimed (munkar). He is also one of the narrators in Ahmad’s Musnad (#5465, 10968-69), which is established as not having a single Mawdu’ hadith. Bayhaqi also records this in his Dala’il, in which, as he said in its introduction, he did not put any forged reports according to him. We also see Imam Shafi’i himself accepting his narrations as proof for certain positions of halal and haram in his madhhab (Kitab al-Umm 2:256, and his Musnad p. 340 #607). A) Hafiz Abu’l Shaykh (K. ‘Adhama, p. 391 #1075) and Ibn Mundhir in his Tafsir narrated this hadith thru Muhammad al-Baqir from his grandparents, as cited by Suyuti in his Tafsir Durr al-Manthur (1:142, of Q2:37). B) The most authentic chain for this hadith is not thru ‘Umar but thru Maysarat al-Fajr, and is narrated by the Hafiz Abu’l Husayn Ibn Bishran (one of the Shuyukh of Bayhaqi and al-Khatib), as recorded by Ibn Jawzi in his Kitab al-Wafa’ 1:33 (which he said contains only authentic narrations) and Burhan ad-Din al-Halabi in his Sira (1:355), with a strong and sound chain (see: Salihi in Subul al-Huda 1:85-86). All of its narrators are trustworthy (thiqa sahih) except one (Abu Bakr Ahmad ibn Ishaq ibn Salih), who is Saduq (see Khatib’s Tarikh 4:28), making this narration by itself Hasan or even Sahih. Also, Bayhaqi quotes the first part of this hadith with the same chain from Maysara in his Dala’il (1:84). See Abdullah al-Ghumari’s al-Radd al-Muhkam al-Matin (p. 138-39) and Shaykh Mahmud Mamduh’s Raf’ al-Minara (p. 247-49). Ibn Taymiyya also quotes both versions saying, “these two are like the explanation of the authentic hadiths on this subject” (Fatawa, 2:150, 159). Imam Subki said it was Sahih in his Shifa’ as-Siqam (p. 134-135). So with the Da’if hadith in Hakim and Tabarani, plus Abu’l Shaykh’s and Ibn Mundhir’s narration, plus the strong narration of Ibn Bishran, this hadith becomes at least Hasan. 32 Also recorded by al-Khallal in his Kitab as-Sunna (1:237, 261), and by Hakim (Mustadrak, 2:614-15) who said it was Sahih, and Abu’l Shaykh in Tabaqat al-Muhaddithin, and others. All of the narrators in its chain are trustworthy (thiqat) except ‘Amr ibn Aws al-Ansari, who is “mastur” (unknown status, no one discredited him) according to Dhahabi, which means that at worse the hadith is Da’if, for the narrations of the “mastur” are accepted according to Dhahabi himself (in his Mizan 1:556, 2:40, 93, and 3:426) and others (such as Ibn Salah in his Muqaddima, p. 145). As for Dhahabi’s words “I think it is forged,” they are not accepted because he brings no proof, and its chain contains no liar or forger. 33 A mass-transmitted (mutawatir) hadith recorded by Bukhari (#4343), Muslim (#4223), Ibn Hibban (14:381, 398), Hakim (1:30, 4:573 Sahih), and many others. 34 The commentator, Shaykh Ahmad as-Sawi, stated here that it is necessary to believe this, and that whoever denies this has lost the benefit of this world and the Next. Imam Shafi’i himself, in the introduction to his Risala, stated the same thing as Imam Dardir. An indication of this reality can be found in the Prophet’s statement, as recorded by Bukhari (3:1134): “Indeed, Allah is the Giver, and I am the distributor (Qasim)”. 35 Recorded (with authentic chains to Ka’b) by Darimi (1:57 #94), Bayhaqi (Shu’ab, 3:492), Ibn Mubarak in Kitab az-Zuhd (1:558), Abu Nu’aym (Hilya, 5:390), Qadi Isma’il (Fadl as-Salat, #102), and Abu’l Shaykh. 36 Consensus on this is documented by: Ibn Habira in Fiqh ‘ala Madhahib al-A’imma al-Arba’a 1:337. Also: (Hanafi): Ibn ‘Abidin (Hashiya, 2:626), Tahtawi (Hashiya Maraqi Falah, p. 70). (Maliki): Qadi ‘Iyad (Shifa’, 2:58), Hattab (Mawahib Jalil, 3:344-45), Qarafi (Dhakhira, 3:378, 381), Nafrawi (Fawakih Dawani, 1:45). (Shafi’i): Nawawi (Majmu’, 7:389), Ibn Kathir (Bidaya, 3:205), Suyuti (Khasa’is, 2:351), Munawi (Fayd Qadir, 6:264). (Hanbali): Ibn ‘Aqil (see: Subki’s Shifa’ Siqam and Ibn Qayyim’s Bada’i Fawa’id 2:147), Ibn Muflih (Mubdi’, 3:70). 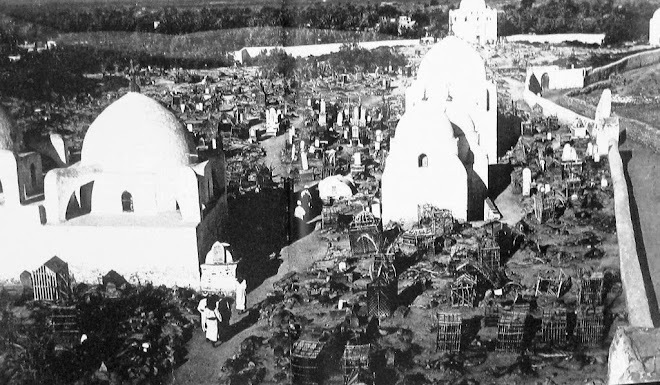 37 Recorded by Bayhaqi in his Dala’il an-Nubuwwa (5:485) and Shu’ab al-Iman (1:170, 331), Ibn Mubarak (Kitab az- Zuhd, #398), Ibn Abi Shayba (7:419), Hakim (4:568), and al-Harith in his Musnad (Zawa’id, p. 283 #939). It is Sahih according to Hakim, Dhahabi, and Busiri (Ithaf, 10:583, 641). See also Darimi’s Sunan (#47-48) and Tayalisi’s Musnad (#252) for narrations of similar import.